We finally went to dinner at Cascina Spinasse, a restaurant everyone keeps telling us to try. Our usual date night is Tuesday, when they’re closed and in March we tried going for Gay’s birthday but missed our reservation. After waiting so long, it was disappointing. They make their own pasta, but the pasta wasn’t especially good. The menu is in Italian with English translations but even those are somewhat indecipherable. The bar is limited, just one bourbon, one gin, etc. and only wine, not even an Italian beer. The rabbit meatballs were excellent, though. Good picture, Gay! Rabbit meatballs, huh? 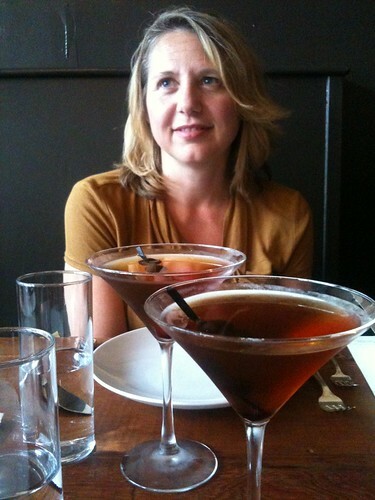 Manhattans look pretty enticing.